Legends are used to provide information about the charts shown on the page and tell you what each bar, line etc. represents. Starting from version 4.0, legends get interactivity: each click on a legend item removes/adds the related data series (the first click - removes, the second - adds, the third - removes and so on). First of all, the legend is specified through the legend parameter. The full list of the legend parameters you can find in chapter 'Legend parameter: attributes'. Use markerType property to assign the desired marker type to a graph. 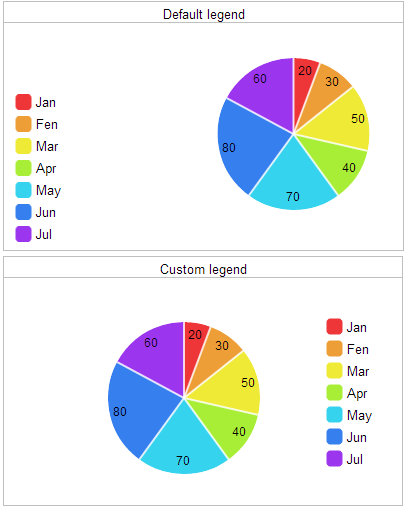 For the Pie chart you may use a predefined definition along with the usual legend definition (shown above) and create a legend in one line - by specifying a template for items labels (dhtmlxChart will do for all the rest for you on its own).